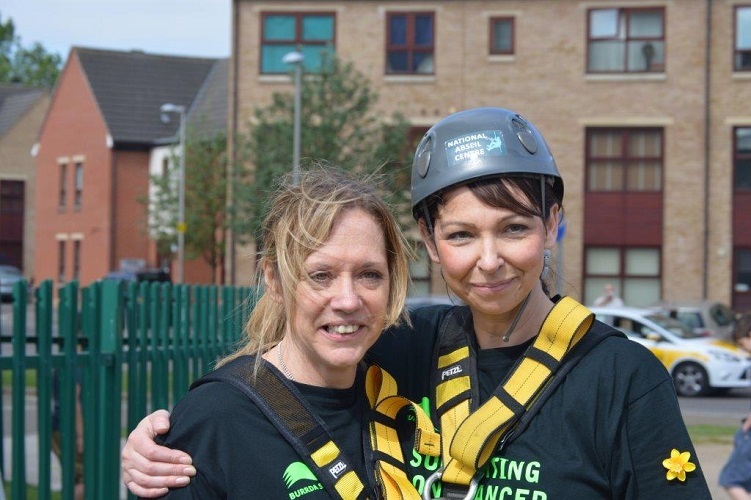 TOTAL AMOUNT RAISED EXCEEDS 35,000 £ - THANK YOU! 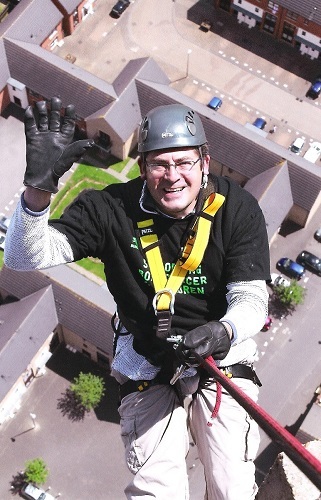 On September 3rd we received the devastating news that Luis’ chemotherapy programme hadn’t worked and his lung cancer was now terminal. From that moment on, Luis had only one focus and that was to enjoy a family holiday and take his sister Georgia to Disney World, Florida. 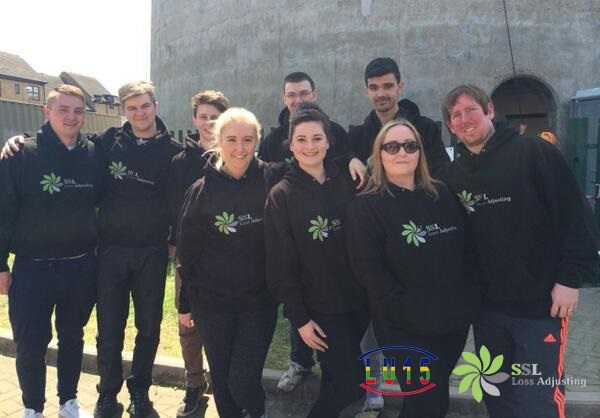 With assistance from the fundraising team LU15, we flew to America on Friday the 12th of September. On Monday the 15th Luis was suddenly taken ill and was rushed to a local hospital. A subsequent CAT scan identified that Luis had developed two brain tumours. One of which had burst and was causing swelling. 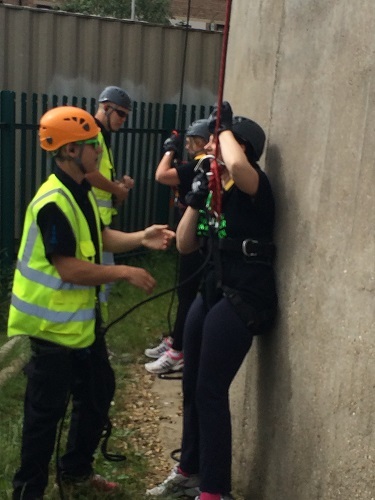 His condition quickly deteriorated and he was rushed to intensive care and placed on life support. Over the next 24 hours the doctors told us to be prepared for the worst. But amazingly after 48 hours his condition started to improve and as such he was able to sit up in bed and communicate with everyone. Luis continued to improve and by Saturday was well enough to be medically evacuated to the UK via air ambulance. We arrived safely home after being discharged from Northampton’s Disney Ward at around noon on Sunday. Much to the relief of Luis who went straight on his XBOX to tell all his mates about his amazing week! His mum and sister also arrived back in the UK on the Monday lunchtime. Tuesday morning saw Luis wake up with a severe headache and by the time he arrived at Disney Ward he was very poorly. 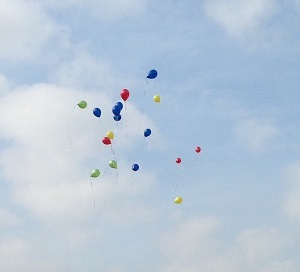 At 13.45 on 23rd September 2014 Luis passed away. Thank you to everyone who has followed Luis through either this website or via Twitter and the funds that enabled Luis to go to Florida. The committee would like to keep the LU15 fund-raising open for donations for the charities that supported Luis, for as long as possible. All our love, the Ghaut’s. Luis, we will never forget you, ever. 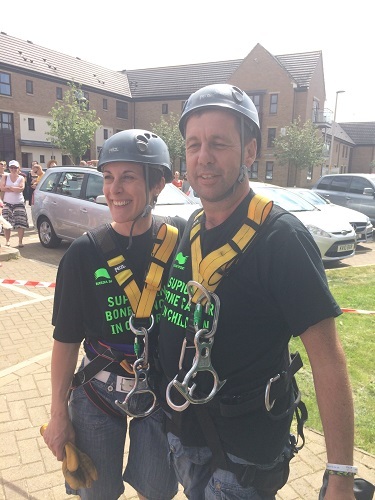 On Monday 19th May Luis underwent a thoracotomy operation to remove the secondary tumour from his left lung at the Royal Brompton Hospital, London. Luis spent a couple of days in intensive and high dependency care units before recovering on the normal children’s ward. Determined to be out of hospital as soon as possible he passed his fitness tests and was discharged on the Thursday evening. 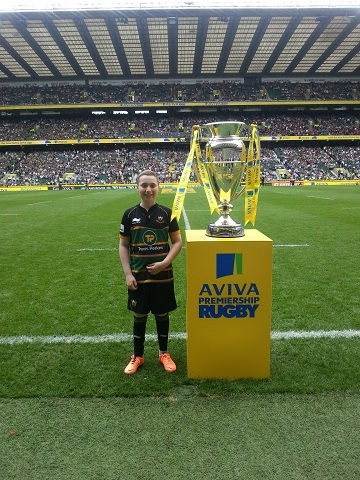 On hearing the good news regarding Luis’s surgery Northampton Saints RFC invited Luis to be their match day mascot at Twickenham for the Aviva Premiership final vs. Saracens. Spurned on with the thought of running out onto the pitch with his heroes Luis continued to recuperate at a fast pace. His recovery was so good no one believed he had actually undergone major surgery only days before! 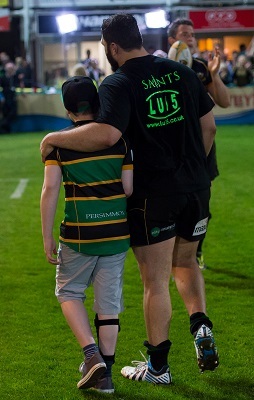 Luis really enjoyed his special day and after the final whistle blew he joined the victorious Saints for the winner’s presentation and lap of honour around the stadium with the players. Luis even managed to blag himself on the Saints bus that paraded the cup around the town centre. Week commencing 2nd June sees Luis continuing with his second bout of chemotherapy at the University College Hospital, London. He is scheduled to undergo an 18 week chemotherapy programme over the course of the school holidays and leading into the start of school year 9. You may see more photos in the photo gallery page. 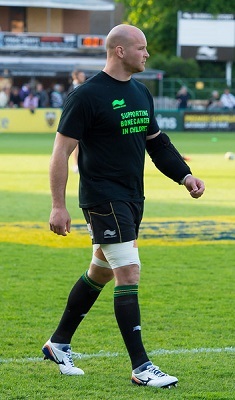 The Northampton Saints players are wearing black tee-shirts with the Lu15 logo on the back, and on the front is the message ‘Supporting Bone Cancer in Children'. 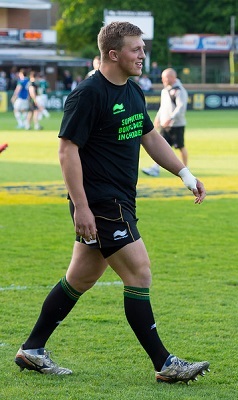 They all wore these whilst warming up before the game, and also wore them after the game as well. 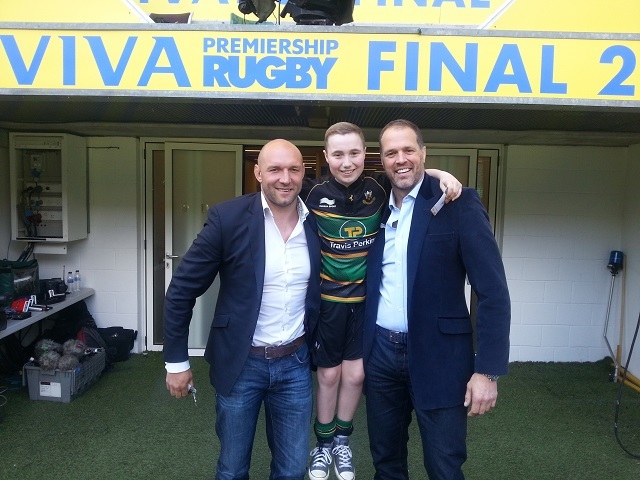 Northampton Saints players - Alex Corbisero and Calum Clark - visited Luis at his home last night, to show him the Amlin Challenge Trophy, which the Saints won on Friday, 23rd May. After 39 weeks, Luis’s surgery and chemotherapy programme finished on the 24th March 2014. Two weeks later we returned to hospital to undertake some end of treatment scans. The results have unfortunately identified a secondary tumour growing within Luis’s left lung. This is commonly known as secondary cancer. Luis will shortly undertake some further tests to see if his cancer has spread anywhere else within his body. If not, then we proceed very quickly to surgically remove the tumour from his lung followed by strong chemotherapy; a maximum of 6 treatments over an 18 week period. At this time I have no further news as we’re waiting for appointments and meetings to be arranged via the London oncology team supporting us. On the 9th September 2013 Luis had surgery to remove 15 centimetres of his upper right fibula, the tumour and unfortunately his peroneal nerve that controls movement in his right foot. This means that Luis has now what is more commonly known as “drop foot” and has to wear a leg splint to help him walk and also a brace when he sleeps to help keep his right Achilles heel and calf muscle in good condition. Only 2 weeks later Luis was back at the University College London Hospital to continue with his next phase of chemotherapy which is scheduled to take approximately 20 weeks to complete. Luis has physiotherapy sessions to help strengthen and increase his lower and upper leg muscles which is critical in ensuring a good recovery from his next surgery planned for late 2014 which aims to regain some mobility. Luis has experienced some low points during his treatment which has resulted in additional stays in Northampton General Hospital; special thanks must go to the staff and nurses who work on the Disney ward who have made sure his time there has been as comfortable as possible. 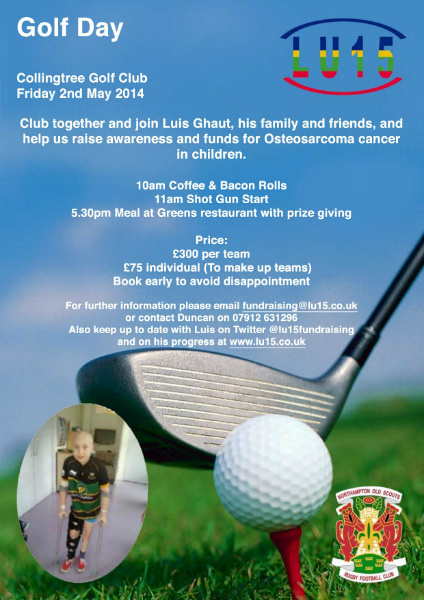 This website was set up in July 2013 by the friends of Luis Ghaut, his parents Lee and Jo, and his sister Georgia is response to Luis being diagnosed a month short of his 12th birthday with an Osteosarcoma (a rare bone cancer) of the fibula in his right leg. Children identified with having an Osteosarcoma are typically ranged between the ages 8 – 16 as rapid growth of the bone plates may be one reason why this type of cancer materialises. Most cancer tumours develop in the bones around the knee, either in the distal femur (the lower part of the thigh bone) or the proximal tibia (the upper part of the shinbone), with the proximal humorous (the part of the upper arm bone close to the shoulder) being the next most common site. However, Osteosarcoma can develop in any bone, including the bones of the pelvis (hips), shoulder and jaw - this is especially true in older adults. Initial symptoms are swelling and pain which is very similar to a fracture or even a muscle tear. Due to the rarity of this condition it is often difficult to identify and the swelling (tumour) usually is the first real identification that something is wrong. If symptoms persist, or if you are in any doubt, please insist your GP refers you to hospital for an x-ray. Luis has been receiving his initial chemotherapy at the University College Hospital London and will shortly undergo surgery to remove the tumour and affected bone structure. Post surgery Luis will continue for a further 20 weeks of chemotherapy and then reconstructive surgery to regain as much mobility as possible. Luis will receive constant monitoring for the next 10 years but in the meantime with the help and support from his family, friends and you we are confident Luis can beat his cancer. 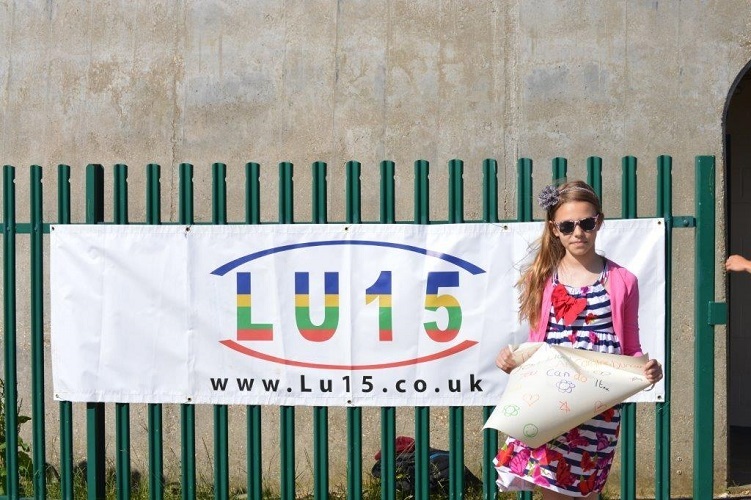 This website and logo Lu15 was inspired by a combination of Luis's Mum and Dad calling him Lu, and his favourite position being full-back, number 15. The colour scheme of the logo comes from the Northampton Old Scouts RFC club colours who Luis and his team mates have been playing for every weekend since they were all six years old. 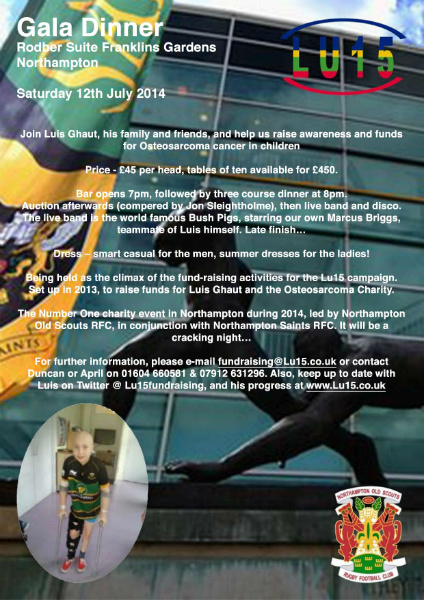 As soon as we heard of Luis's illness we knew we had to do something to support Luis in his battle. 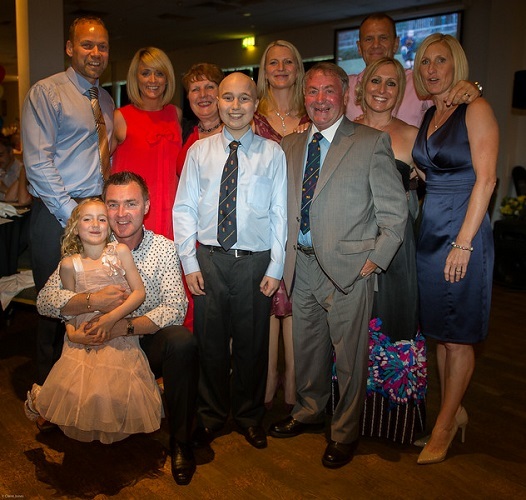 Our primary aim is to help raise awareness of Osteosarcoma by organising some fundraising events and once Luis's treatment is finished, and if funds allow, to also send Luis and his family on a holiday of a lifetime next year. 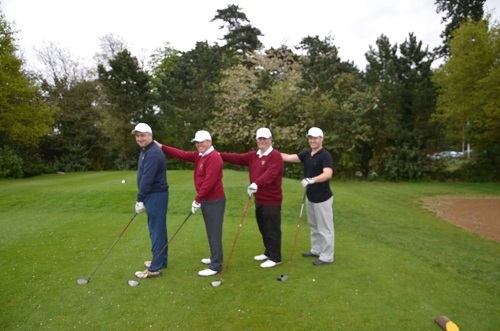 Golf Day – was held at Collingtree Golf Club on Friday 2nd May 2014. 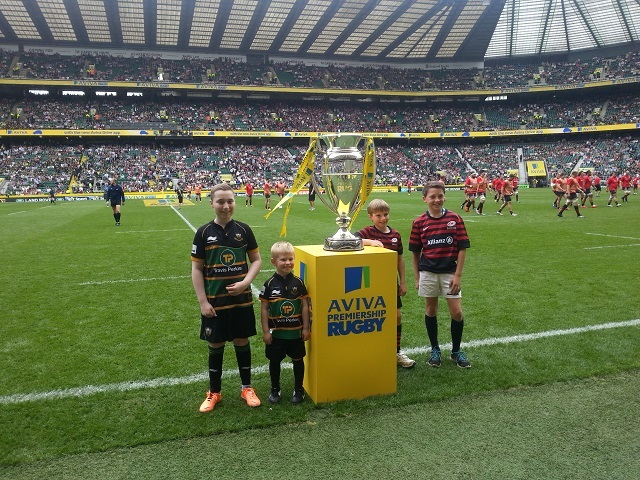 There were 16 local teams, made up of friends of Luis’s family, members of Northampton Old Scouts Rugby Club, and several local companies. 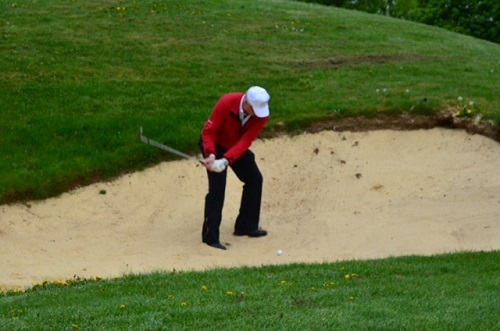 We are enjoyed 18 holes of competitive golf, on a wonderful course. The highlight of the day was Luis arriving in time for dinner, which was an amazing achievement considering he had spent the whole day in a London hospital having tests, he even presented the trophy to the winning teams! 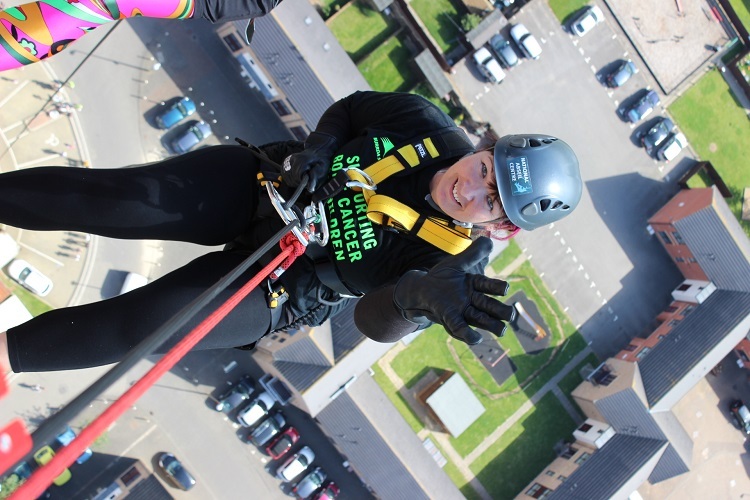 We are pleased to say that due to the generosity of everybody who attended the day, we raised the fantastic sum of £4,216. 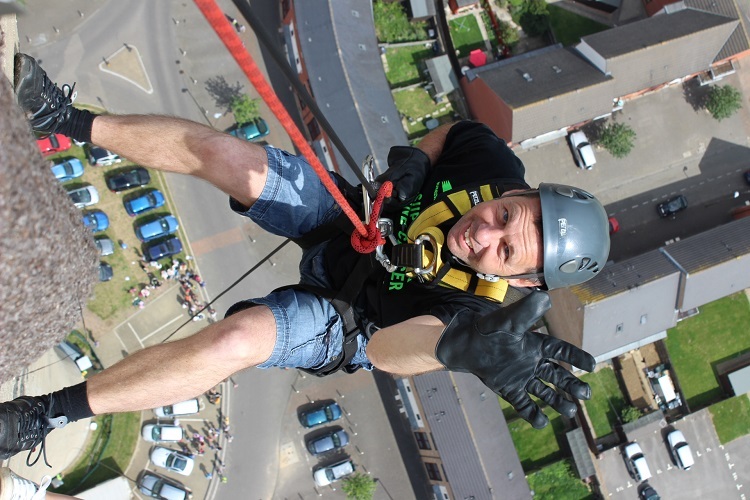 Our huge thanks to everybody involved, a handful of photos are attached. 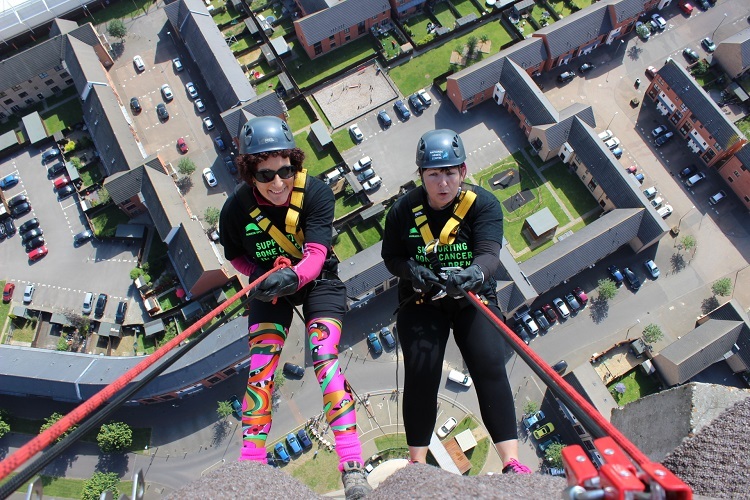 Northampton Lift-Tower Abseil – was held on Saturday 21st June 2014 and it was a tremendous success. 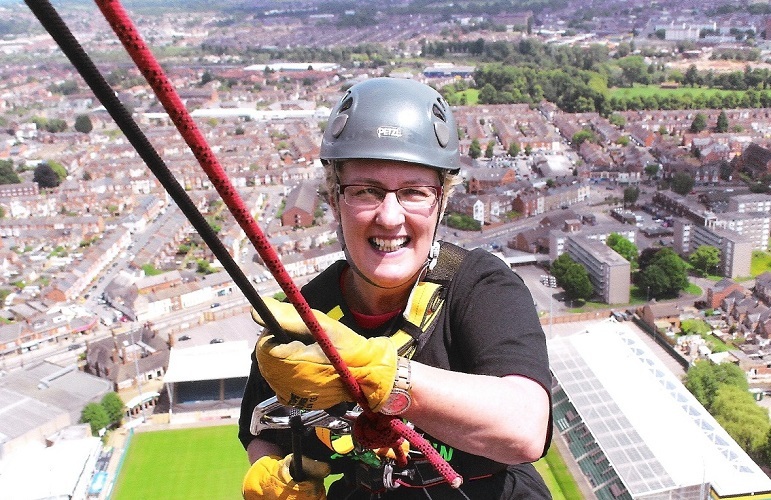 45 people took part, abseiling down the tallest lift-tower in the world (416 feet high!). 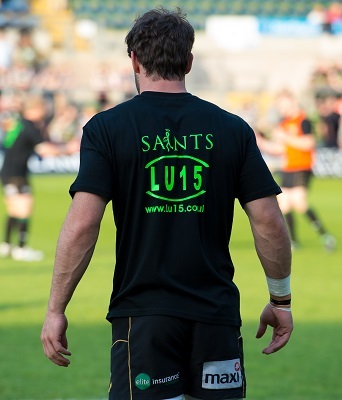 In total, we raised £4,500 for the Lu15 fund-raising campaign. 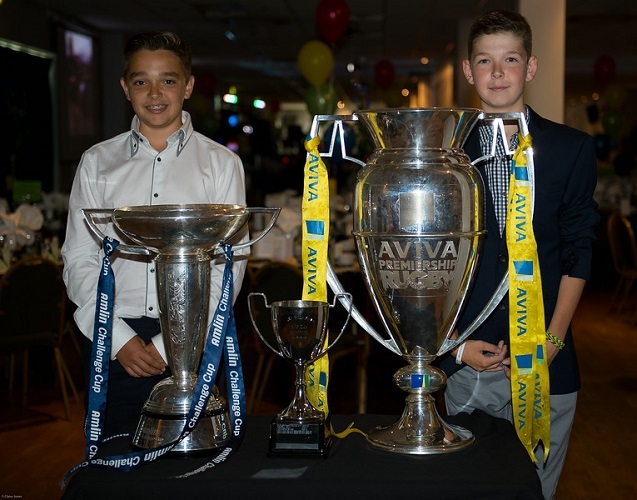 Gala Dinner – held on Saturday 12th July 2014, at the Rodber Bar, Franklins Gardens, Northampton RFC (2014 Premiership Champions). Attended by 400 people. 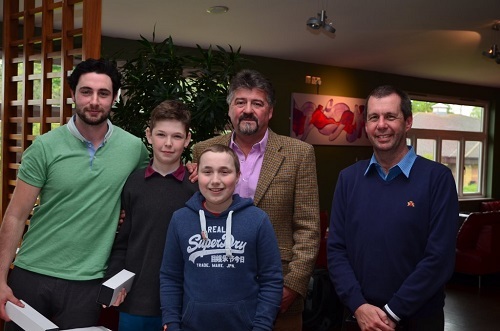 A three course dinner was followed by a Live Auction which raised £6,000, a Silent Auction which raised £4,000, and a raffle which raised over £1,500. There were 115 raffle prizes, of which 1st prize was Signed England Rugby shirt, 2nd prize was an iPad, and 3rd prize was a whole lamb. After the auction the famous Sixth Fifths band (as from Northampton Old Scouts RFC), and the popular local band Bush Pigs (led by Luis’s team-mate Marcus Briggs) played until past midnight, with a disco finishing at 2am. 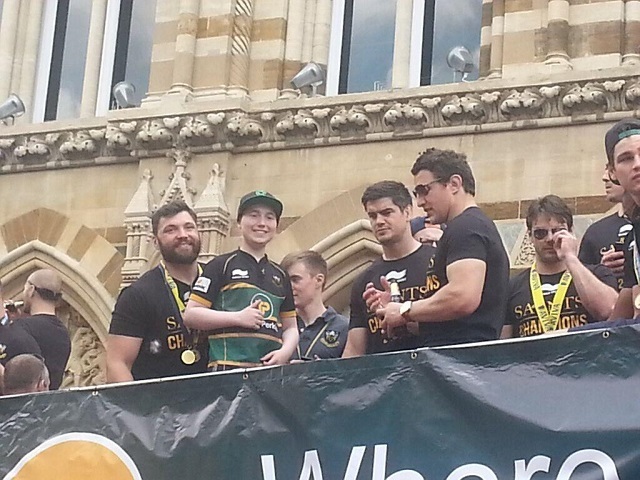 Special guests of honour were the Northampton Saints players Tom Wood, Alex Corbisero, James Craig, Alex Waller and Dom Waldouck. 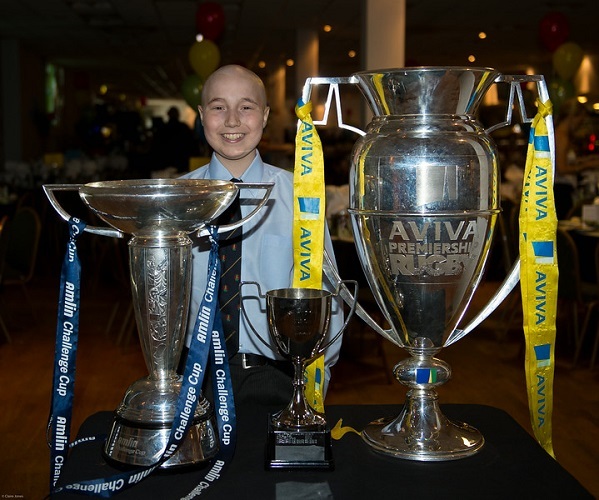 The evening was led and compered by ex-England and Northampton Saints player – Jon Sleightholme, but the highlight of the evening was un-doubtedly Luis’s speech. It was an incredibly moving moment, during which Luis explained more about his battle with cancer, and the treatment he has had to endure during the last twelve months. The standing ovation he received was truly deserved – Luis proved why he is an inspiration to us all. 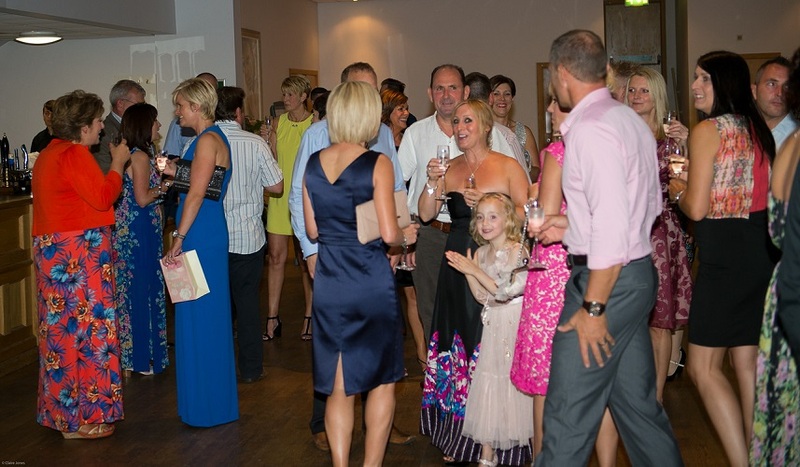 It was an absolutely fantastic evening, all the guests drank and danced until the early hours, and by raising over £11,500 everybody showed how generously supportive they were. To help promote our activities and this website there are a limited amount of baseball caps and wristbands available. 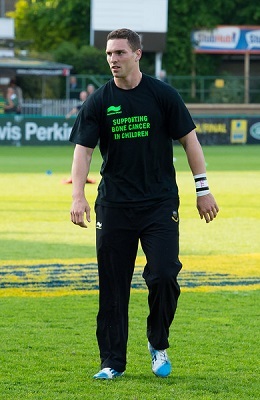 Awareness of this horrible illness is key, we are very grateful for all your support. 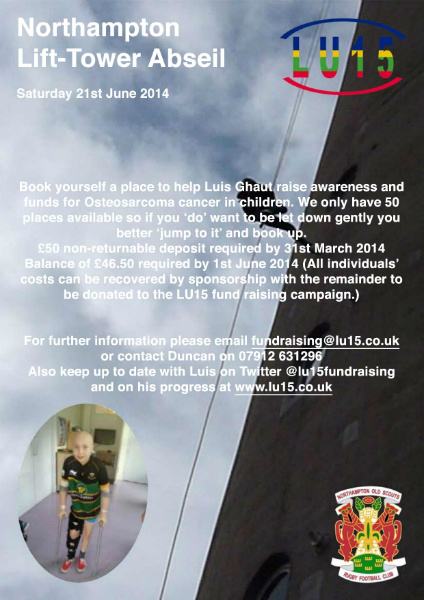 If you would like to take part in Luis's events or if you would like to contribute in any way there is further information available at www.lu15.co.uk. Two of Luis’s friends from his school – Campion School, Northamptonshire, Ellie Walters and Sally Needham, did the Campion Bake Off on 22nd October 2013, and sold the cake to raise funds for Luis. They made £30. They have donated this money to Luis, and we would like to thank them for the efforts and kindness. 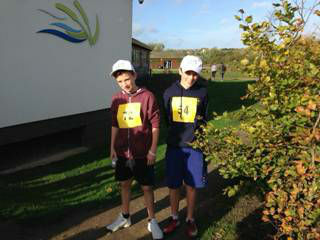 A couple of Luis’s friends – Noah and Thomas, recently ran the 5k Pumpkin Run at Stanwick Lakes yesterday and took the opportunity to get some sponsorship for Lu15. They both ran really well and raised just over £200 between them.